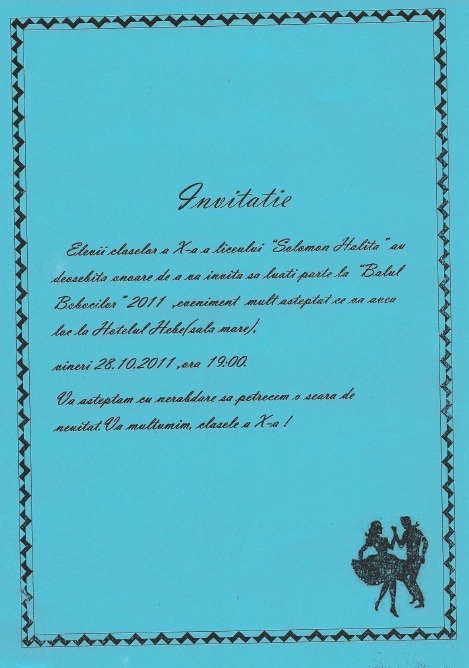 Or in English, the Freshman ball is an annual event held in highschools throughout Romania. The upper class-men (in my school’s case, the 10th grade) put on a dance welcoming the freshman into the school. A Miss and mister are selected based on various tasks they perform throughout the contest part such as answer intelligence questions, general knowledge questions, peeling potatoes, tying ties, and finally a dance contest. Last night was one of the funnest nights I’ve had in country. Picture around 400 students, dressed in their best clothes, hair, make-up, cologne, the whole 9 yards, descending on the local hotel and surrounding areas. There were girls running to each other, checking out each others outfits, other taking group pictures of this magical night and some even squeeling with excitement. The festivities were supposed to start at 7pm but, on this side of the hemisphere, that is a mere suggestion. The lights were dimmed and first cake was brought out with the largest amount of sparklers atop it that my eyes had ever seen. La multi ani (to many years) was played followed by the happy birthday song?!?! This is were I couldn’t help but laugh. For my readers back home, la multi ani is the happy birthday song but it is also sung for almost any occasion therefore, I’m assuming the DJ must have assumed that the happy birthday song was the same way?? After the introduction, the professors, judges, and students took their places for the show. The first item on the agenda were the speeches. My mayor, vice mayor, high school director, and director adjunct were asked to say a few words to the 9th grades. Then the 5 groups of contestants were presented to the judges and the competition began. The first thing the kids had to do was answer intelligence questions, followed by general knowledge questions. Then came the event that would separate the boys from the men. While being timed, the boys were required to clean a potato as fast as they could while the girls were required to tie a tie. This was the most amusing to watch since some of the boys “cleaned” the potato so well, that there was nothing left to it. The last and final event was a dance competition. The DJ played a mash-up of songs that ranged from slow, to hip-hop, to dance, to folklori, and finally manele (music created by gypsys). After about 20 minutes of deliberation, the judges came back and it was time to announce a winner. The winners were announced in the normal pageant competition style were 2nd place and runner up were announced first. By the time the competition was over, it was already pushing 9 o’clock. The chairs were moved out of the way and the hall was transformed into your typical Romanian night club. Kids, smoking, drinking, dancing with each other as far as the eye can see. Yes, there really isn’t a drinking age in this country so there was a bar. The one thing I have noticed about Romanian dances and clubs in general is that they are much more tame than in the States. I remember my high school dances and how we were all grind up on each other like a cat using a scratching post. Here, it was much more PG and most of the dancing was two-step and twirling with some stylistic moves thrown in from time to time. From talking with other volunteers, they mentioned how they usually went home by the time the kids got rowdy but that was not the case for me. All of the professors mixed in with the kids and we ended up dancing all night long. In some instances, the professors were more fun than the kids. 2am rolled around and we had decided it was time to get going. We left the kids to their own on the dance floor and headed home. This was a great experience for me and I’m so happy I got to hang out with my students outside of school to get to know their individual personalities better. Can’t wait for next year! Amazing post!!! Can’t wait to share the potato peeling contest with my friends!!!! How completely random it seems to me. Love reading your blog, so full of interestingness! It’s pretty cool that the ages seem to mix more comfortably in RO, isn’t it? Thanks so much for this post.